Much has been written about Neil Armstrong, America's modern hero and history's most famous space traveler. Yet shy of fame and never one to steal the spotlight Armstrong was always reluctant to discuss his personal side of events. Here for the first time is the definitive story of Neil's life of flight he shared for five decades with a trusted friend – Jay Barbree. 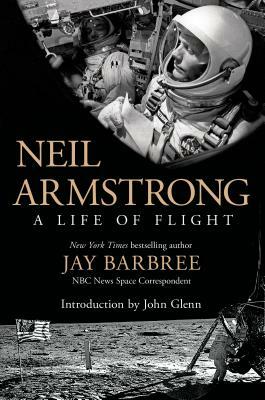 Working from 50 years of conversations he had with Neil, from notes, interviews, NASA spaceflight transcripts, and remembrances of those Armstrong trusted, Barbree writes about Neil's three passions – flight, family, and friends. This is the inside story of Neil Armstrong from the time he flew combat missions in the Korean War and then flew a rocket plane called the X-15 to the edge of space, to when he saved his Gemini 8 by flying the first emergency return from Earth orbit and then flew Apollo-Eleven to the moon's Sea of Tranquility. Together Neil and Jay discussed everything, from his love of flying, to the war years, and of course his time in space. The book is full of never-before-seen photos and personal details written down for the first time, including what Armstrong really felt when he took that first step on the moon, what life in NASA was like, his relationships with the other astronauts, and what he felt the future of space exploration should be. As the only reporter to have covered all 166 American astronaut flights and moon landings Jay knows these events intimately. Neil Armstrong himself said, "Barbree is history's most experienced space journalist. He is exceptionally well qualified to recall and write the events and emotions of our time." Through his friendship with Neil and his dedicated research, Barbree brings us the most accurate account of his friend's life of flight, the book he planned for twenty years. In the course of his 55-year career with NBC News, JAY BARBREE is the only reporter to have covered all 166 American astronaut flights and moon landings. He received an Emmy for his coverage of Neil Armstrong’s first walk on the moon, broke the cause of the Challenger accident, and he still covers space for NBC’s TV networks and NBCnews.com. Barbree was also the lead writer for the New York Times bestseller Moon Shot with astronauts Alan Shepard, Deke Slayton, and Neil Armstrong.